Another trip to Sabkhat Al Fasl, in the company of Phil Roberts, meant an early 04:45 hrs start and due to the good traffic conditions we arrived a bit before it was light with the temperature a cool 7 degrees Celsius. Just as light was breaking we saw an adult Greater Spotted Eagle, which is often the first species we see on trips to this site, flying over the road and then again perched on a fence post as we were preparing all of our gear. After a short drive through the rough grass and scrub area where we failed to locate any birds, we saw another 1st calendar year bird on the ground. It soon became apparent it was on a feral pigeon and if the light had not been so poor we could have obtained some good photographs. A car then drove up behind us and the bird flew off and we felt very disappointed another opportunity to photograph this species had passed us by. This disappointment soon grew to elation though, as we drove past the pigeon and saw it was tethered to a large stone and had many loops of nylon wrapped around it and was being used as a decoy to trap birds of prey, falcons rather than eagles I suspect, but who knows what would have happened to the eagle if it had become trapped and we were not there? 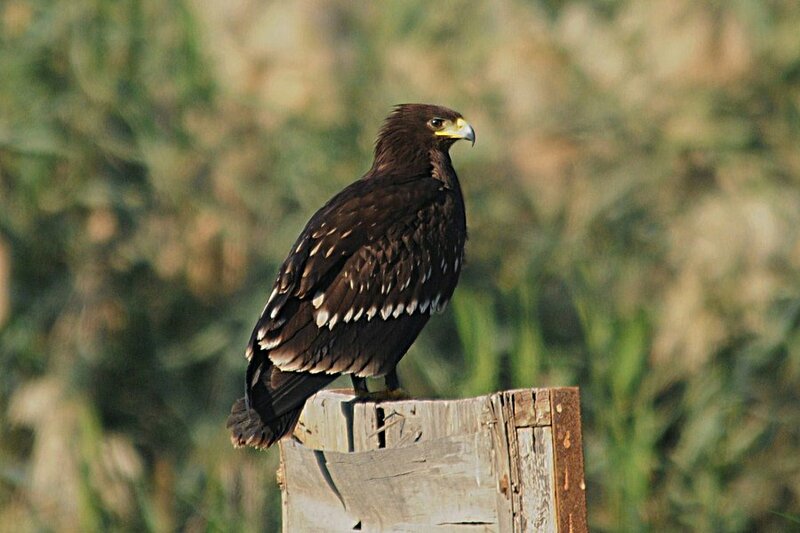 This location is an excellent place to see Greater Spotted Eagles in the winter with birds being seen on every visit so far this winter and in good numbers. Today we saw nine birds including four adults and five 1st calendar year birds along with a first calendar year Eastern Imperial Eagle. On the way out of the site we saw a first calendar year bird perched close to where we had seen the bird on the pigeon but this time the pigeon was gone and the bird was safe. We managed to get a couple of reasonable shots of the bird before leaving it in peace. 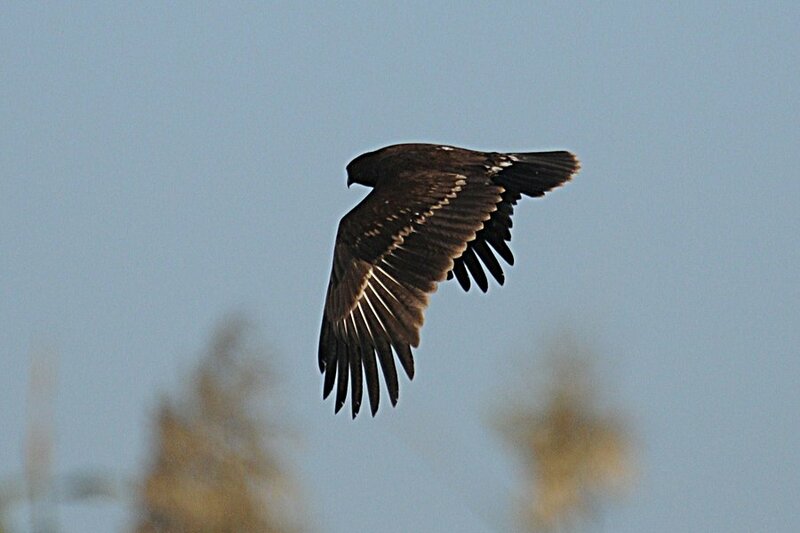 The flight shot below is of a different individual to the bird perched. 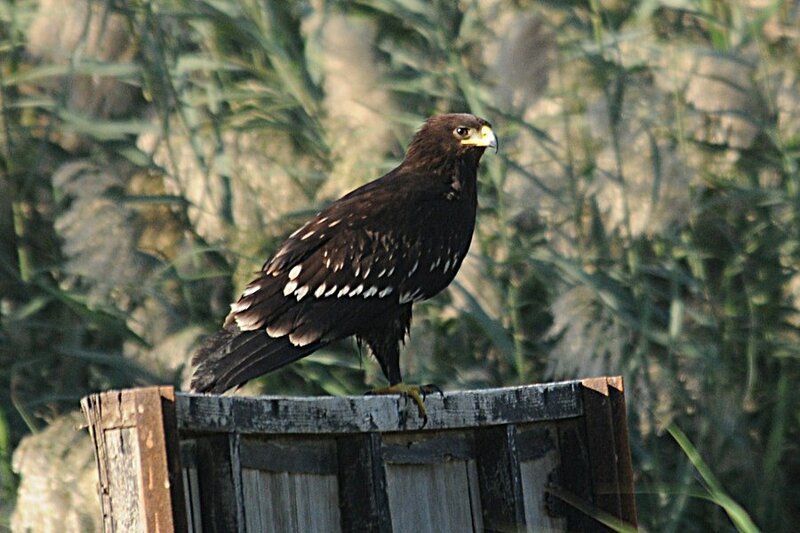 Great Spotted Eagle prefers areas with few humans present and during the breeding season occurs in lowland deciduous forests near wetlands, nesting in tall trees. They also like wet meadows, swamps and marshes to hunt over and feed on carrion, small mammals, water-birds (Eurasian Coot, Rails & Ducks), frogs, lizards, snakes and fish. Birds can hunt from flight, a perch or on foot and engage in kleptoparasitism from each other and from other raptor species. Incubation starts with the laying of the first egg and lasts for about 42 days, with the nestling period being 63-67 days with usually only one chick surviving. It occupies a fragmented range, breeding in Finland, Latvia, Lithuania, Estonia, Poland, Belarus, Moldova, Russia, Ukraine, Kazakhstan, mainland China and Mongolia, with a global population size of 5000 – 13200 individuals. 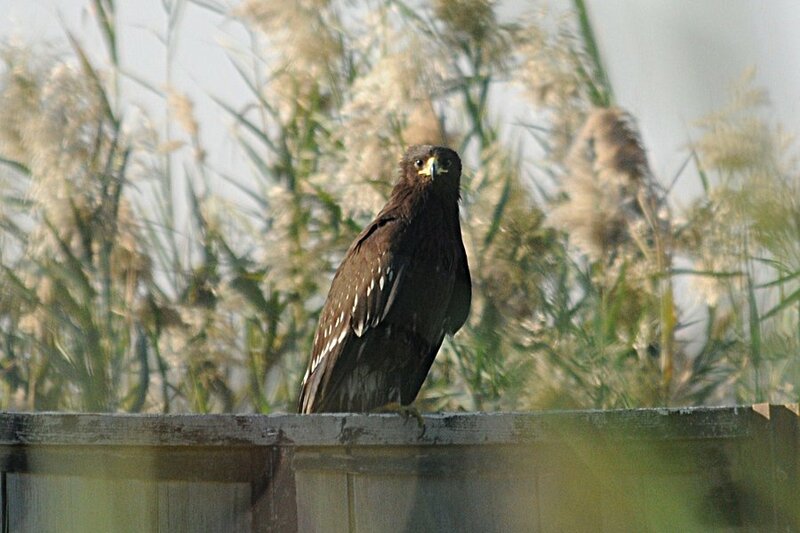 Passage or wintering birds occur in small numbers over a vast area, including central and Eastern Europe, north and east Africa, the Middle East, the Arabian Peninsula, the Indian subcontinent and south and South-East Asia. Outside the breeding season birds occur in drier and more open habitat. It is on the IUCN Red List and is listed as Vulnerable as it has a small population that appears to be declining owing to extensive habitat loss and persistent persecution (Birdlife International 2011). What a beautiful majestic bird! Those photos are fantastic. I quite enjoy bird watching but usually I only see songbirds. The eagle sure is beautiful. Thanks for sharing and thanks for visiting my site yesterday for my flag counter. Have a great Sunday!